Please deliver to Mayor and Council. My name is Malcolm Johnston and I have been involved in Metro Vancouver transit issues since 1986 and I again involving myself with the proposed Broadway subway, which is being supported by a foundation of deceit and deception which sadly, seems the common story today in BC. I find it odd that what we call SkyTrain, has been rejected around the world as being hugely expensive to build than light rail and also has been found to cost more to operate and maintain. Bombardier Inc. the sole vehicle supplier of the proprietary railway has now folded the Innovia Metro (Mk. 2 & 3 vehicles) line into the existing Movia Metro Line of vehicles. Bombardier likes it so much that ART SkyTrain isn’t even identified as a separate product anymore. It been buried into the larger, better selling Movia line. This means every bit of technology on the SkyTrain is now a design option and not connected permanently to the product. As far as Bombardier is concerned, the SkyTrain has now become indistinguishable from its other Metro and Light Metro products! I am disturbed that Translink’s old SkyTrain ruse is still so effective, but without any investigative reporting by the mainstream media and so many politicians who want to jump on the subway band wagon the decision to build a subway really does not surprise me. According to the Toronto Transit Commission (TTC), the North American standard for building a subway is a transit route or portion of a transit route that has customer flows in excess of 15,000 persons per hour per direction. Calculating the maximum traffic flow on Broadway, using TransLink’s timetabled bus schedule, found the maximum capacity TransLink offered on Broadway was under 4,000 pphpd. Thus customer flows would be about the same. In no way is there the customer flows on Broadway to justify a subway. Yes, one can build a subway, but one must be prepared to pay high subsidies to keep the subway operating. But, TransLink will already be paying extra high subsidies for the subway because the route is heavily used by U-Pass holders, which means, TransLink’s most expensive transit route will be unable to generate much revenue. This means the Broadway subway must find additional revenue sources. The TTC estimates that a new 6.5 km subway will add over $40 million in additional operating costs, thus it is safe to assume that the Broadway subway, just to Arbutus will increase TransLink’s operating subsidy by at least $40 million a year. Combine the operating subsidies needed for the subway, plus the operating costs, the cost to the taxpayer will be in excess of $100 million annually! This is no surprise as the annual operating subsidy for the original Expo line to New Westminster was estimated by the GVRD at $157 million annually! From the Cost of Transporting people ….. GVRD 1992. Has anyone ever thought about the long term financing for the subway? The following is from a 2012 email from Wolfgang Keller, a German Transportation Engineer, should give pause to reflect that subways do have an expensive down size. Has anyone looked at the long term finances of this subway? TransLink planning veterans Tamim Raad and Brian Mills were fired because they asked those same questions and didn’t like the answer. They did not support the subway and were fired. 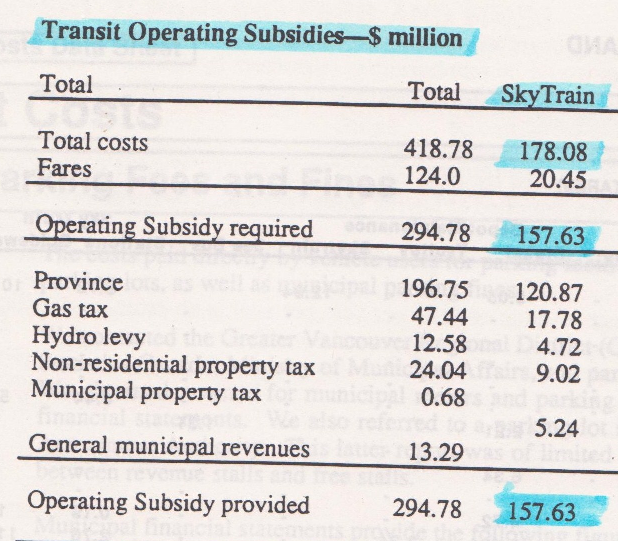 Now, let’s continue with TransLink’s pro SkyTrain biases. American Transportation Engineer, Gerald Fox, was asked in 2008, by a Victoria group wanting streetcars in Victoria to look at the business case for the Evergreen Line. His comments on the Evergreen Line’s business case was telling telling. “The Evergreen Line Report made me curious as to how TransLink could justify continuing to expand SkyTrain, when the rest of the world is building LRT. So I went back and read the alleged Business Case (BC) report in a little more detail. I found several instances where the analysis had made assumptions that were inaccurate, or had been manipulated to make the case for SkyTrain. If the underlying assumptions are inaccurate, the conclusions may be so too. The report by McElhanney Consulting Services Ltd is badly flawed from the start, just as the Evergreen Line’s business case was. The consultants apparently have no background light rail or light metro and make many fundamental errors. From the very beginning the study is biased against light rail and treats light rail as TransLink did in Surrey, planning LRT as a poor man’s SkyTrain. An extreme example is Karlsruhe Germany. The huge success of its regional tramtrain system, saw the main tram (streetcar) route through the city seeing a peak hour service of 40 second headway’s with coupled sets of trams and tramtrains giving a hourly capacity of in excess of 35,000 pphpd! 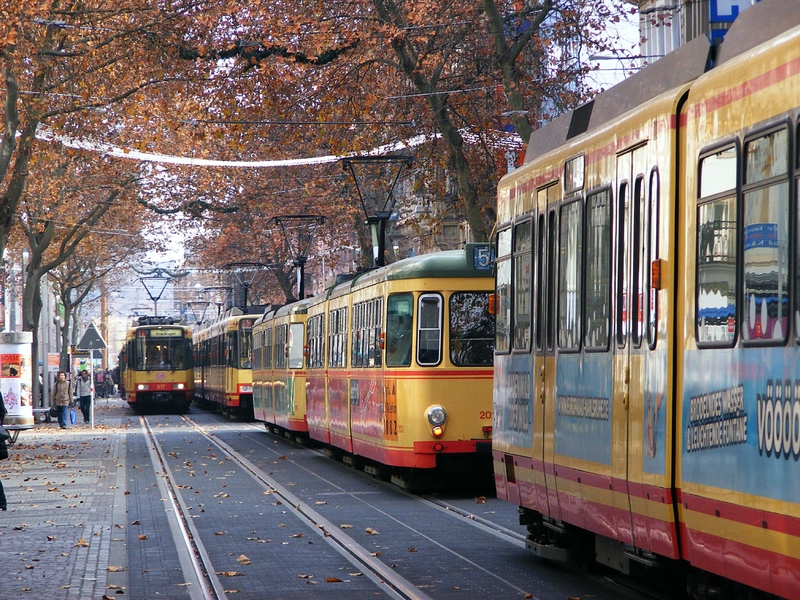 The “gelbe Wand” or yellow wall (referring to the yellow trams) on Kaiserstrasse in Karlsruhe, Germany. Karlsruhe is now building a subway for that portion of route! 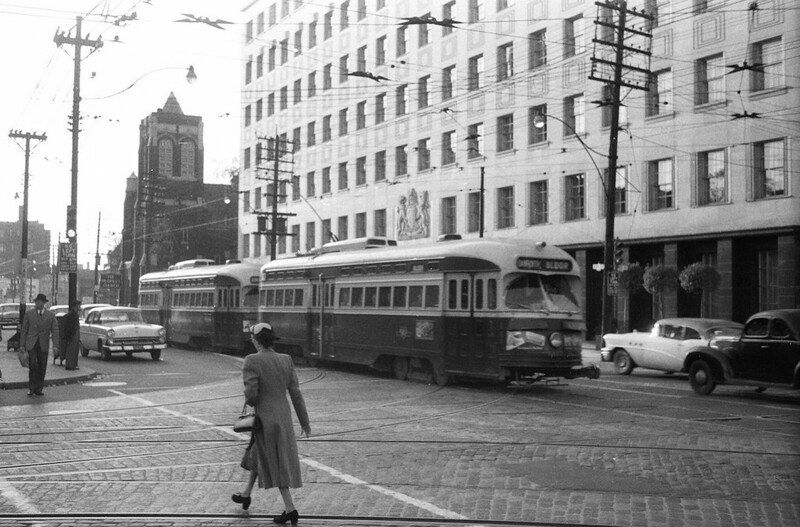 Before Toronto built its first subway, the Bloor-Danforth route saw coupled sets of PCC cars operating in peak hours, offering an hourly capacity of 12,000 pphpd! coupled sets of PCC cars operating in peak hours obtaining a capacity of 12,000 pphpd! To say that a modern LRT line has less capacity than an old streetcar line’s capacity, seventy years ago is more than a farce, it is deliberately dishonest! Another questionable statistic is reliability as there has been no study offered to back up the claims that SkyTrain is unreliable. Most if not all LRT lines operate to a strict schedule, no so for SkyTrain as there is no strict schedule at all, only a train every few minutes. Any claim that is based on the reliability figures given should be immediately discounted. The numbers given for light rail in the study are not just unreliable, they are deliberately skewed to favour SkyTrain. Thus the study is based on dishonest statistics and is useless as a planning document. It is another glaring example of TransLink using their cunning method of manipulating analysis to justify SkyTrain in corridor after corridor, and has thus succeeded in keeping its proprietary rail system expanding. Just as a reminder only seven of the proprietary SkyTrain systems have been built since the late 1970′s; only three are seriously used for urban transit; two are mired in court cases and investigations; one will soon be torn down as it is fast becoming “life expired”. Not one SkyTrain built has ever been allowed to compete directly against light rail and this study by McElhanney Consulting Services Ltd. Is to ensure LRT does not compete against SkyTrain for transit on Broadway or in Metro Vancouver. Thus the McElhanney Study is a political document masquerading as a technical document. The following excerpt is from the December 1983 edition of Modern Tramway’s article The direction of TTC Planning in the 1980′s. Clearly, the elderly Toronto trams were able to move more people in 1983, than what McElhanney Consulting Services Ltd.would have us believe what a modern articulated tram can move in 2019. I think someone should demand their money back! Such a study would be not allowed here. Such a study would lead to severe legal consequences. Skytrain has not been discontinued and will not be anytime soon. Merging one rail division into the other rail divisions does not mean it is not being discontinued. Good news, Translink is proceeding to extend skytrain to UBC and Langley at the same time. It will be more popular and faster than current bus service. So Paul who is going to pay for all this plus the upgrade to Expo line? I am overtaxed and have no more to give. Maybe make developers pay? Also get rid of that U Pass too. Paul, why are they shutting down Bombardier’s Montreal Area semi-permanent Skytrain production lines after the newTranslink’s order is complete. The 200 new cars (50, 4 car trainsets) seem to have only delayed shutdown from 2020 to around 2023/4 They can’t keep a production line open for product no one is buying, that’s why. The line is expected to be re-tooled for the new long term New Jersey Transit Commuter Rail Passenger Car Order. This means any new Skytrain orders after that must wait for an open production line somewhere and wait for the line to be re-tooled. The cost of which is added to the next vehicle order. One other thing, for the 3rd time in a week, due to snow and extreme cold weather, the TTC in Toronto has been forced to shutdown the Scarborough RT (Line #3) for the whole day and replace it with a interim bus service. Today’s date is January 31, 2019. The LIM Propulsion Units have always had problems with Toronto winters. Paul its a big deal when a rail car provider folds a product line from its own independent slot into another product line. Bombardier only does that when it essentially is saying, “yes we still make the Skytrain but it’s not a major product line for us anymore.” The good part is that the product didn’t get moved to the Monorail and People Mover side of Bombardier Transportation, that’s literally known inside the company as, “the kiss of death” for any rail transit product.